After creating a buzz with their self-released debut album back in 2010, Seattle's The Head and the Heart landed a recording contract with Sub Pop. 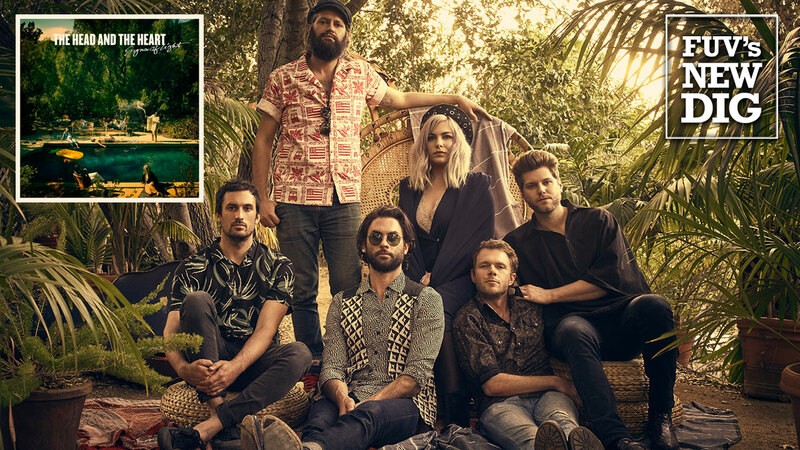 The restructured album was reissued by that label in 2011 and from that point, The Head and the Heart began its rise from underground darlings to the forefront of the indie folk rock spectrum. The sextet's second album, Let’s Be Still, followed in the fall of 2013. By 2014, the Head and the Heart had concluded a hectic touring schedule in support of the second album. Needing some downtime, the six members of the band—singers and guitarists Josiah Johnson and Jonathan Russell, violinist, banjo player and vocalist Charity Rose Thielen, bassist Chris Zasche, pianist Kenny Hensley and drummer Tyler Williams—took a break and went their individual ways to fulfill personal aspirations. During this time, each musician reinvigorated and rejuvenated themselves personally and artistically. This newfound focus fueled the creative juices and lead to the creation of Signs Of Light, their third album and the band's first for Warner Bros. Records. Conceived in California but mostly recorded in Nashville, Signs Of Light is the work of a band that has come into its own. Their formative years are behind them and the development of an identity is well underway. The artistic vision is clearer. The echo-drenched “Oh My Dear,” which is reminiscent of the work of fellow folk rockers Lord Huron and Fleet Foxes, sets the stage for the buoyant “I Don’t Mind.” The track “Library Magic” is a reflection on the breather that the band took after their second album. “Take A Walk” can be construed as a bit motivational advice. It’s often evident that the songs on Signs Of Light were created in California because the album is brimming with golden-sunshine-kissed textures and even features a salute to Los Angeles in the propulsive “City Of Angels.” There is more of a pop sense on this new album with less of a reliance on rootsier moments that were part of the first two albums. The guitars are brash and bright, with more use of electric instruments than acoustic. The rhythms are bold and the overall mood is one of joy, even if the lyrics occasionally lean towards darker themes. All but one of the songs on Signs Of Light were written collectively by the band, with help from Dan Wilson on “Turn It Around” and J. Roddy Walston on “Colors.” The one cover is “False Alarm,” which was written by Matt Hopper and originally performed by Matt Hopper and the Roman Candles. Jay Joyce produces most of the album, except for the epic title track, which originated from early sessions held in Texas, and was produced by the band. With Signs of Light, the members of The Head and the Heart have created a work of thoughtful rumination, unbridled enthusiasm, and cheerful optimism that is utterly infectious. Hear The Head and the Heart on FUV this Friday at 1 p.m., recorded live at City Winery.